If you missed the general gear post I did yesterday, I would suggest checking it out if you are interested in how many shirts we have, or what bikes we ride, but if you already have the basics figured out, this list of unusual yet helpful tips may be just for you. –Stick and Break: Check out the link to read more about our unusual (and free!) kickstand which doubles as a dog scaring weapon as well. -An extra water bottle mount to keep your dirty fuel bottle on the outside of your bike. This is for those of you who use international stoves like we do (which run off of anything, including petrol) though I would suggest as many water bottle holders as you can because you will end up using them for one thing or another. –Containers are extremely useful for everything from hand soap to shampoo to left over food. We are currently using a Gatorade bottle to hold our shampoo, and another similar juice bottle to hold our oil. Little spice containers also come in handy as spices come in bulk in most of the world. 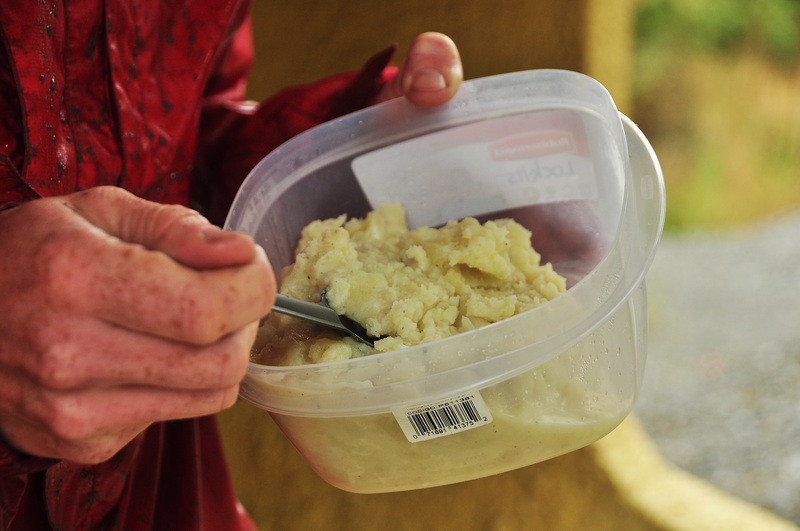 We recently bought a Rubbermaid container which we love as we can cook an extra big dinner (mashed potatoes, lentils and rice…) and save some for the next day’s lunch. –Keens: Through rain or shine, keens are the best cycling shoes ever. You can walk through rivers and mud without any problem, you can wear them at night as slippers with socks, they let your feet breath in the summer but still provide support, and they are extremely comfortable! I will someday invest in a pair of waterproof socks, and once I get them, I’ll be able to tour comfortably even throughout the winter with just one pair of shoes. Keens are definitely the way to go. -Never underestimate the power of rope. 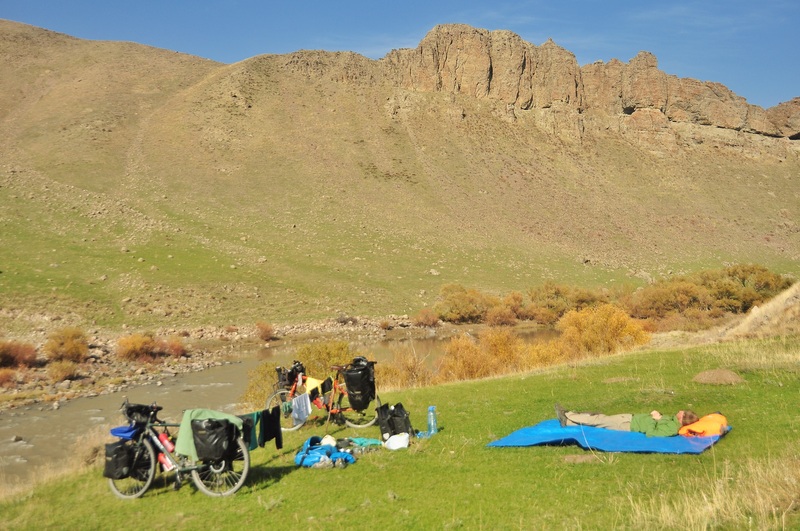 Kevin can make me a clothes drying rack anywhere with some rope (as when there are no trees he just sets it up between our bikes), as well as a belt, a shoe lace, and even, a clothes line inside of our tent. -Though we haven’t done this yet (we have met others who have) yellow dish washing gloves are a whole lot cheaper than gortex and work well for keeping your hands dry on particularly wet days, especially if you slip them on over your thin biking gloves or liners. –Seat post hide-a-way. Kevin has some cash, a copy of his passport, and our barbecue skewers hidden away in his seat post. His seat post also comes in handy when he needs leverage (like for taking off our pedals) as he can attach it to a wrench. –Small cheese grater: We use this little guy for grating potatoes or carrots into a soup (or for making hash browns) and though it may seem funny, we really do use it a lot. 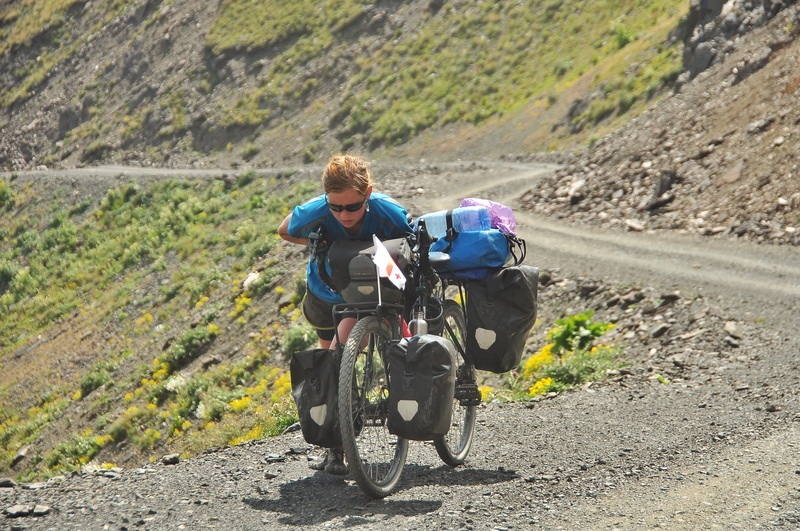 -We have found that besides the typical four ortlieb panniers, the handlebar bag and rack pack are essential to our organization and sanity. The handlebar bag holds our cameras, wallets, passports, and sometimes snacks, and since it can be easily carried into a store when we leave our bikes, we feel safer about our valuables. The rack pack has turned into our tent bag and contains everything from a water pump, to our toiletries, to our flashlights… everything we need once we get into our tent. They are both expensive bags, but they have definitely been worth every penny. For our full gear list, click here. 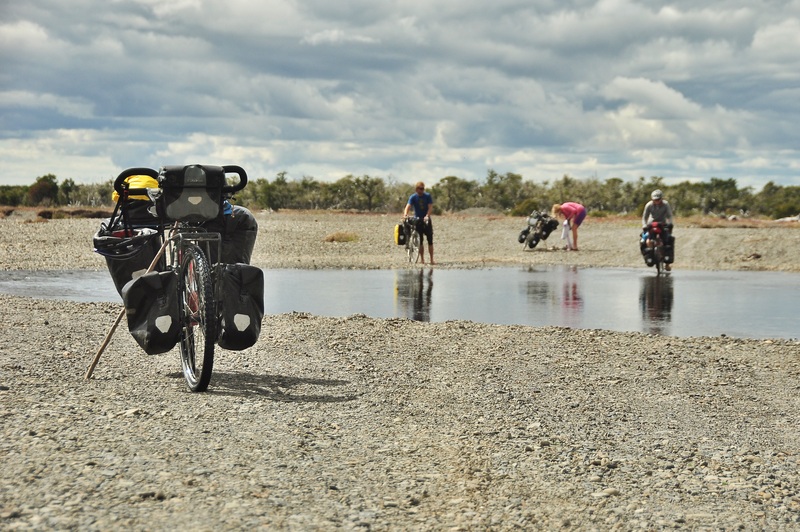 This entry was posted in Chile, Patagonia and tagged bike gear, cycle around world, cycle touring gear, gear list bike trip, tips for cycle tour by The Wandering Nomads. Bookmark the permalink. The second photo on this post reminded me to ask you why you don’t have fenders (called mudguards in Europe, I believe?) 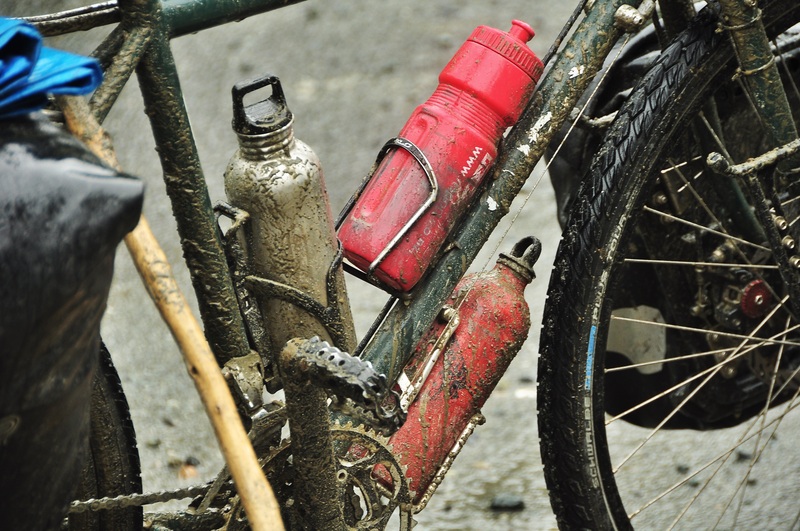 Fenders (especially with little mud flaps at the bottom) keep you clean and dry (especially your feet and legs) as well as your bike and equipment (kit). I have fenders on all three of my bikes and can’t imagine life without them. Even for people who never ride in rain (who are THOSE people anyway?! 🙂 )there’s always something spraying upward. Fenders fix all that especially on dirt roads. Mudguards are a personal choice and a clear division between those that swear by them and those that wouldn’t give them a second look. I like them. They protect the bike, the rider and reduce wear and tear. The downside is that mud on bad trails can get so clogged up under them that it causes a real problem. But a very good reason for leaving them off is that they often end up damaged. Cargo handlers or just bad luck can find them trashed. I have had to replace mine after most long trips having had to hold them together with tape. I agree with both sides of this! Fenders also keep your drivetrain cleaner which means it will have a longer life. Yeah we will definitely be getting a pair! I guess we just met a lot of tourers who don’t have them and figured we don’t either. It’s sort of just another thing to deal with, and another thing to pack in the airplane, and our bags normally protect us pretty well. That being said, I have them on my commuter back home and should probably get some for this bike now too!! Small Grater, excellent, will now be out looking for one to add to my kit. I also use one item that I call a luxury item. Clothes dryer sheets, there are a couple in the bottom of my sleeping bag and a few packed up with the clean clothes and several go in the ziplock bag of dirty clothes. They are cheap and last for a long while. Maybe it is just me but a shirt that has been worn for several days but still smells good has a few more days of use ahead..
I’ve heard of that before but had forgotten, thanks for the tip!